Call it nostalgia, call it getting old... but I've developed a new respect for the difficulty level of making all the pastries we had growing up. It's hard trying to get the cakes and bad as pillowy soft as I remember growing up. I probably just took it for granted then, but trying to recreate it now is a whole other story! This cake is massive. I wanted to make sure I had adequate batter for a multi layered sponge, and after making a bunch of chiffon cakes in the past, I knew it required a lot of eggs. But I may have gone a bit overboard with this one. I used 16.... yes.. 16 eggs in this cake. It made 3 super tall, fluffy layers... which we all ate in about 2 days. But this is fair warning, this is not a dainty cake. Just a couple of notes. When separating the egg whites, make sure the eggs are cold. This will make the job a lot easier! Use BIG bowls! Use the biggest bowl you got to whip up the egg yolks, because you will eventually have to fold in all those egg whites into the yolks so you'll need the space. And if you have a bigger rubber spatula, use it. This cake is a great arm work out! Click on the pics below to see all the steps! Once all the layers were baked, I whipped up some fresh whipped cream with a bit of sugar. Most Chinese baked goods are not very sweet. Just enough, so there's nothing cloyingly sweet about this cake. Then its time to layer on the cream and fresh sliced strawberries. I dusted on some powdered sugar, just to highlight the strawberries on top and it's time to slice in. This cake was as big as my dad's head, but that doesn't mean we didn't polish it off! Preheat the oven to 300F. Line 3X 9 inch cake pans with parchment. Whisk egg yolks with 1/4 cup plus 2 tbsp sugar till the yolks turn a light yellow and build in volume. Add oil, vanilla and milk and whisk to combine. Sift in flour and corn starch and whisk to combine. In a stand mixer fitted with a whisk attachment, beat the egg whites and cream of tartar until foamy. Slowly add in 1/2 cup of sugar, once that is combined add in the rest of the sugar. Beat until you reach soft peaks. Fold in 1/3 of the egg whites into the egg yolk mixture. Once it is well combined, fold in the rest of the egg whites. Make sure to fold it in gently, but thoroughly to ensure no white spots. Pour into the prepared pans and bake for 20 minutes. The cake is done when the cake springs back when pushed. Remove to a wire rack, peel off the parchment and allow to cool completely. To make the whipped cream. Beat cold heavy cream till it starts to thicken. Add in the sugar and vanilla and continue beating till it builds in volume and is thick and fluffy. Do not over beat because it will turn into butter!! To assemble. 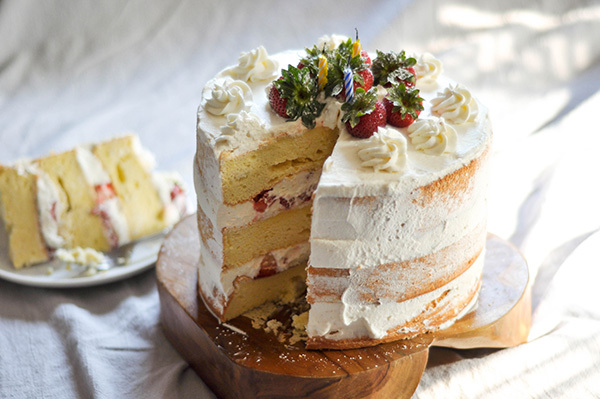 Spread the whipped cream on top of the cake layer, then add the sliced strawberries, top with cake, cream, strawberries and the final cake layer. Frost the outside of the cake with the whipped cream using as much or as little as you like. Top with whole strawberries and dust with powdered sugar.